The Most Powerful Invisible Key logger Software in the World ! Invisible keylogger is stealth key logger tool just for you ! Invisible keylogger is a superior stealth surveillance application that is completely undetectable. During monitoring sessions Invisible Keylogger can be customized to be completely invisible and cannot be seen in the task manager, programs files menu, system tray or uninstall list. With Invisible Keylogger running all information will be captured in complete stealth mode! Record all keystrokes typed, chat conversations, email, desktop activity and more with the most powerful stealth surveillance application offered anywhere and at the lowest price with a 30 day money back guarantee. Completely Stealth - Configure Invisible Keylogger to hide during monitoring sessions and it is virtually impossible to detect. Invisible Keylogger will not be listed in the task manager and also gives you the option to remove it from the uninstall list! Superior stealth performance that is unmatched by others! Windows Startup - Configure Invisible Keylogger to startup for a single user, or to start up as a service for all users on the system - perfect for monitoring multiple users of a PC. Intelligent Startup - Automatically begin recording immediately all users no matter if they are password protected! 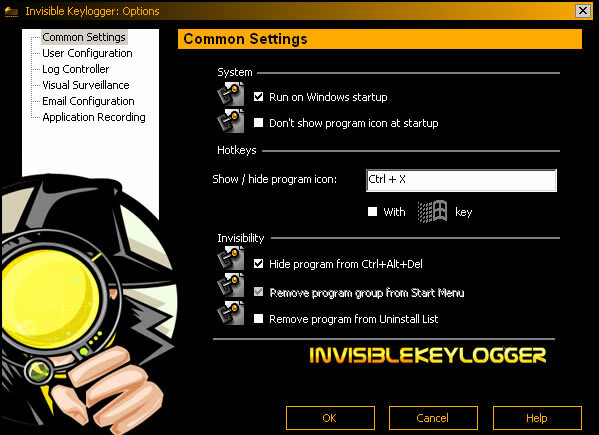 Upon windows startup Invisible Keylogger will capture all information from all users! Password Protection - Invisible Keylogger is password protected to prevent others from starting/stopping the recording process, as well as changing Invisible Keyloggers configuration settings. Encrypted Log Files - Invisible Keylogger encrypts all logs files and protects them from being viewed. Only you can read the logs with a unique username and password that you may change at anytime! Application Monitoring - Invisible Keylogger can record all applications ran and the text typed in these applications. You are given the option to specify which applications you want Invisible Keylogger to record. Usernames/Passwords - Invisible Keylogger will capture all user names and password secretly in complete stealth mode! This includes all https: secure user logins /passwords as well as html based user logins/passwords. Chat Messengers - Invisible Keylogger will capture all text on AOL / ICQ/ YAHOO/ MSN /AIM MESSENGERS and store logs in an easy to read format that is time stamped on every event captured! Log Exporting - Export Invisible Keyloggers recorded logs into an easy to read HTML document for later viewing or records! E-Mail Recording - Invisible Keyloggers super stealth recording will capture all emails composed secretly. All emails including subject and content body are recorded and can be sent via email with reports at anytime! Dates Manager - Invisible Keylogger is equipped with a calander that seperates logs by specific dates and times. All recorded sessions will be grouped by date, month, and hour. This will enable you to narrow down who was using your computer and when. Email Delivery - Invisible Keylogger can deliver reports of recorded activity secretly at set intervals. All logs can be sent by email secretly for you to read at anytime! You no longer have to wait for reports anymore! Clipboard Recording - Invisible Keylogger will record all clipboard text and save it for later viewing! This will enable you to see all text even text that has been cut and pasted in a browser, email, or Anywhere! Screen Shot Capturing - Invisible Keylogger will secretly record desktop activity at set intervals. You may choose to have Invisible Keylogger only record activity if a user is present! All activity is secretly recorded and can be viewed and thumbnail size or original full scale size inside Invisible Keyloggers password protected viewer! Auto Log Clearing - Invisible Keylogger can be configured to clear all logs at set intervals as an added security measure. You may also clear logs at anytime and completely remove them from your computer! Window Activity Logging - Invisible Keylogger will capture information on every window that was viewed and interacted with secretly at anytime and save all window titles from later viewing. Keyboard Logging - Invisible Keylogger will record all keystrokes typed secretly, completely undetectable to the user! The Keylogger will also capture international keyboards! Website Logging - Invisible Keylogger will record and time stamp all websites visited. If a user is surfing inappropriate content, Invisible Keylogger will record this content. You may re-visit all websites directly inside the Invisible Keylogger log viewer. Password Logging - Invisible Keylogger runs silently in kernel mode enabling it to capture windows login passwords! This is the maximum level of snooping not offered by any other competing product! Graphical Interface - Invisible Keylogger has a very intuitive and friendly user interface. All functions are self explanatory and actions can be easily executed with a click of the mouse! Only 334kb - Not only does Invisible Keylogger offer superior stealth performance, it also offers a stealth compact file size that enables you to download it onto a disk at anytime! Kernel Mode Driver - Invisible Keylogger offers the lowest level of monitoring by injecting a system with it's kernel mode driver. This will ensure all logon passwords are captured! You can now login to that account and view information once the password has been captured! 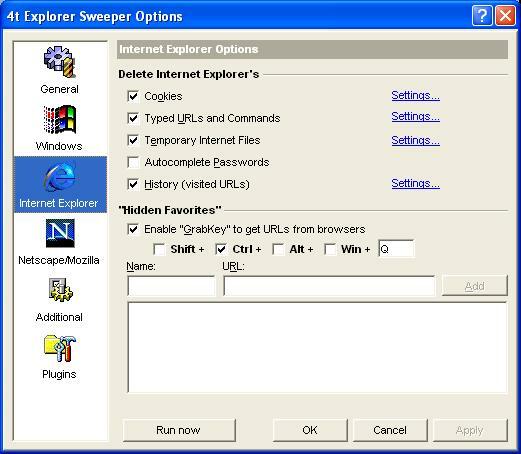 Spyware Doctor - Spy Doctor is one of the most popular spyware detector and removal program on the market.